In total around 8 miles (12.8km) – so adds around 3 miles to the standard coast path route. Strenuous Grade all the way as you cross the Mountain Pass with a very stunning but very steep final descent to Barmouth. Experienced Walkers only this would be Severe grade in poor weather. 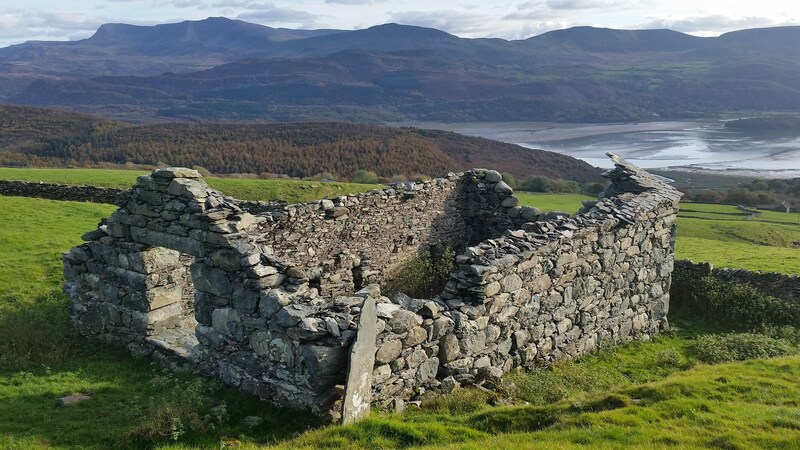 A superb alternative which avoids the section which follows the road into Barmouth and where you experience wild terrain with some of the best views to be had in this part of Wales. 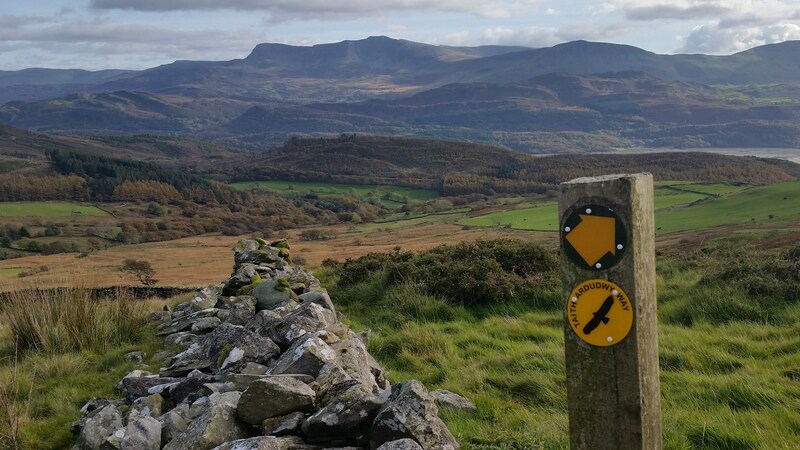 There is no better way to meet Cadair Idris and the Mawddach Valley then, having toiled up over the drover’s pass, you suddenly see it laid out before and below you. In past times, drovers would take over 400 animals over the pass on their way to the English Markets with shouts of Heiptro Ho as they toiled along the droves. Farmers would bring out animals for the drive when the drovers passed, cattle were shod, a mix of sand and tar applied to the feet of geese and pigs were given wool and leather socks for the climbs. You must climb to around 450m (1200 ft) so there is significant effort involved and you won’t pass a dwelling or be anywhere near a road for the ridge ascent. 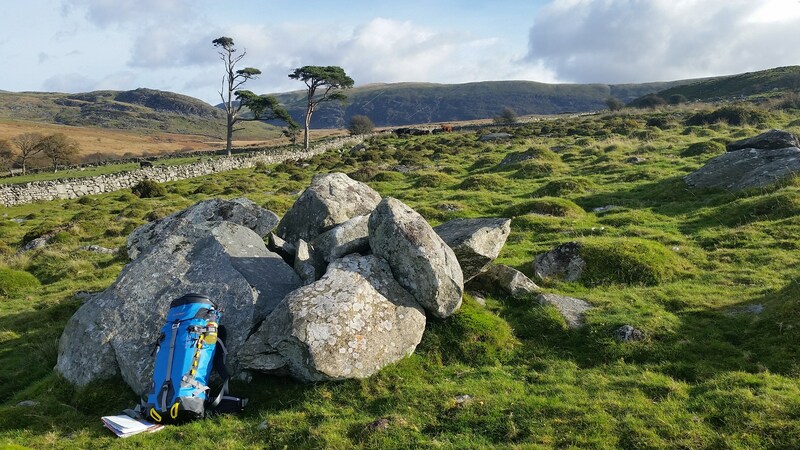 However, for fit and regular walkers, confident with a map and with a sense of adventure, then it is easily doable and a hugely satisfying route into Barmouth. The ascent from this side is steady and the views just get better and better as you climb. Are you convinced? If so, leave the coast path at the little village of Tal-Y-Bont, with the last chance to stock up with refreshments at the riverside gardens of the Ysgethin Inn - formerly the old woollen mill. The path leaves from here with a wonderful walk up the bubbling Afon Ysgethin. Little more than a large stream, walk for two miles alongside waterfalls and pools, surrounded by sturdy oak and ash woodlands, through pleasing glades, beneath cliff banks, in a fertile world of green moss-covered trees and boulders. At times you are forced to climb above the river cliffs and at one stage you find yourself on a lovely wide woodland drove track. All too soon the adventure ends and you reach Pont Fadog, where an ancient bridge still stands over an infant mountain river, the last structure before the mountain itself. Emerge from the woodlands via a short section of track into a different world on the slopes of the mountainside. 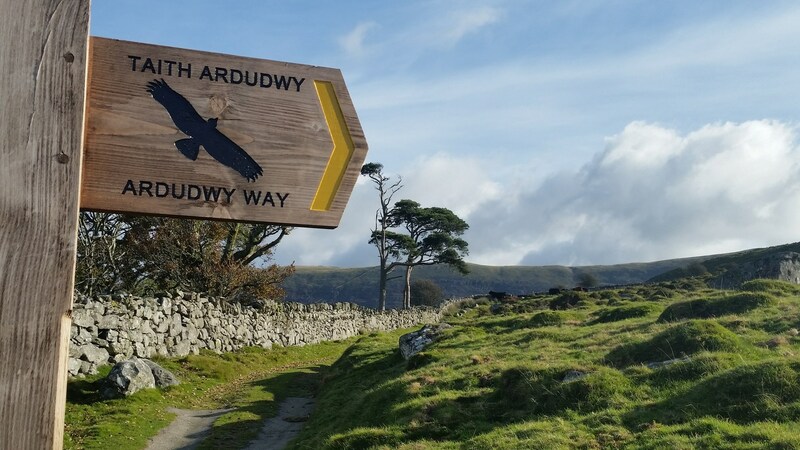 Suddenly peaks tower around you, with huge scree slopes and barren cliffs - welcome to the Ardudwy Way. You now have an hour’s climb up the flank of one ridge on the old green drovers’ road, aiming for the significant pass between peaks at Bwlch y Rhiwgyr – ‘The pass of the Drovers’. It’s a steady climb, with the views just getting better and better as you rise. Now you can see more and more ranges of mountains. Only the occasional bubbling stream and the bleating of distant sheep breaks the silence and there’s a feeling of isolation, with no road or house in sight in any direction, as you enter the final bowl of the Rhingogs, wild and heathery hills stretching into the interior with a real taste of the Welsh mountains – look up as you reach the top of them and watch out for the feral goats that cling on here. Towards the top, things narrow and steepen – just imagine trying to drive flocks of sheep over this –but after a final push you emerge at the summit of the pass. The giant mountains of Snowdonia are behind you now as you gaze straight across the lush Mawddach valley. This is your first sighting of the mountain of Cadair Idris and what a sight it is from up here. 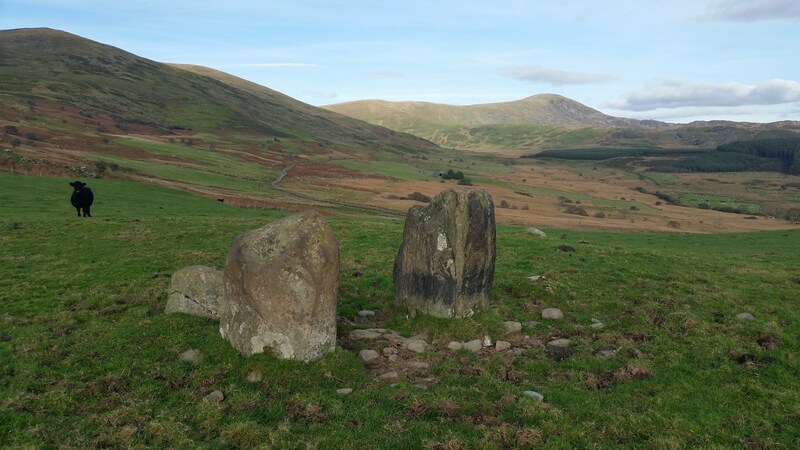 It’s a steep descent down the top of the pass, pausing to visit the three Cerrig Arthur Stones, part of a lonely ancient stone circle –who put them here and why? Herds of hardy sheep accompany you as you walk along the high flank of the Mawddach valley, still following the green grassed drovers’ tracks. Far below you, the tidal river becomes forest then grassy mountainside. Above you are the moraines and screes of the highest peaks on the ridge. Climb up to the second pass of the day at Bwlch y Llan through an area of peat and boulders and finally the reassuring sight of the sea returns, far below you down the mountainside. The views stretch out as far as Bardsley Island, several weeks walk away at the end of the Lyn Peninsula. The final descent into Barmouth is steep and dramatic. On the way down you pass ruins, old forts and mine workings before a dramatic plunge, snaking down the cliff paths on an impossibly steep and craggy hillside, before tumbling onto the golden sands of the estuary. Barmouth…well…it’s Barmouth and you are likely to arrive into holiday madness, but what a contrast for you, having travelled from one of the remotest passes in the area to get here. CLICK HERE for information on your overnight in Barmouth on The Snowdonia and Meirionnydd Coast Path.